The wholesale division of AAG is dedicated to educating mortgage brokers and bankers, credit union lenders, community bankers, and other financial services professionals on how to leverage reverse mortgages as a strategic financial planning tool for their senior clients. American Advisors Group (AAG) is the leader in reverse mortgage lending, specializing in reverse mortgage loans since 2004. Our wholesale division works closely with mortgage professionals, community bankers, credit unions and retirement planners to help senior homeowners convert a portion of their home equity to fund long-term retirement plans, allowing them to age in place. With a trusted and well-recognized brand in the industry, proven tools and support, our mission in wholesale reverse mortgage is to attain the highest level of borrower and professional partner satisfaction. HECM reverse mortgages have helped over a million seniors comfortably age in place. Learn more about how these products can help your customers fund the retirements they have worked so hard to achieve. Thank you for requesting more information about services from our Wholesale Division. We have received your request, and will contact you soon. By providing the requested information and clicking "Submit", I provide my signature expressly consenting to contact from American Advisors Group or its subsidiaries, affiliates, or agents at the number I provided regarding products or services via live, automated or prerecorded telephone call, text message, or email. I understand that my telephone company may impose charges on me for these contacts, and I am not required to enter into this agreement as a condition of purchasing property, goods, or services. I understand that I can revoke this consent at any time. To speak with someone at American Advisors Group, please call (866) 964-1290. Hands-on training to support your sales team’s development. Customizable and compliant materials through our Wholesale marketing portal, available to you 24/7. Access to legal and compliance review for marketing materials. A dedicated Lender Support team to navigate your loans from submission through funding. Access to a suite of proprietary home equity solutions. Access to AAG’s Concierge Experience (ACE), our internal team of processing experts to help you every step of the way. 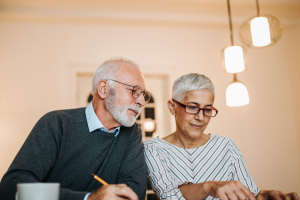 A reverse mortgage loan helps provide greater financial security to over a million seniors in the U.S. Find out why today’s savvy financial service professionals utilize reverse mortgages to help retirement-aged clients improve their financial futures. 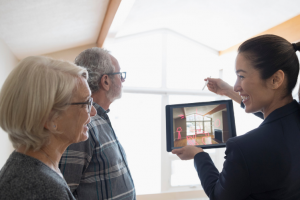 To learn more about reverse mortgages, read through the following commonly asked questions–and consider adding this secure and viable financial planning tool to your portfolio of products. An FHA reverse mortgage is a government-insured loan for senior borrowers age 62 and older. This financial tool allows the borrower to access a portion of home equity and convert it into cash to utilize proceeds for however he/she sees fit. Common uses include paying for medical bills or other debt, home repair and improvements, traveling and supplementing your client’s retirement portfolio, among others. For more in depth reverse mortgage information, visit our "What is a reverse mortgage?" page. 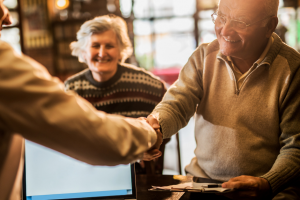 What are my client’s payment options with a reverse mortgage? Combination of any of these. The choice is ultimately your client’s, but your American Advisors Group partner will educate you on how to guide your client through the disbursement option that is best suited for your client’s situation. How much money can my client get with a reverse mortgage loan? Borrowers won’t owe more than the value of their homes. As long as the borrower complies with the loan terms, he/she doesn’t have to make payments on the loan. With a reverse mortgage loan, the borrower will not lose Social Security or Medicare benefits. Reverse mortgages afford borrowers greater financial freedom and control, providing them the dignity and security they deserve. How does my client qualify for a reverse mortgage loan? 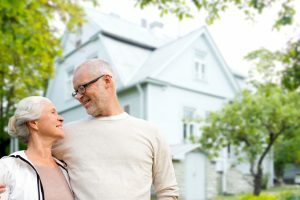 To qualify for a reverse mortgage, borrowers must be at least 62 years of age, own their home and occupy it as their primary residence (among other requirements). If they have equity in their homes and are looking for additional income, a reverse mortgage can provide the funding needed to allow them to stay in their homes. This is a popular misconception. When used wisely, a reverse mortgage can be a very powerful, viable and strategic financial tool. There is no better product more readily available to the senior population in terms of supplementing retirement, balancing a portfolio and managing retirement risks. However, the reverse mortgage should be evaluated based on the borrower’s particular needs and financial background. 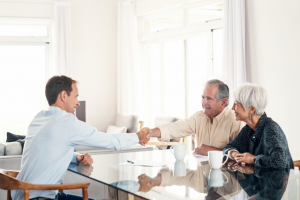 Your AAG reverse mortgage partner can help guide you through your client’s specific situation. 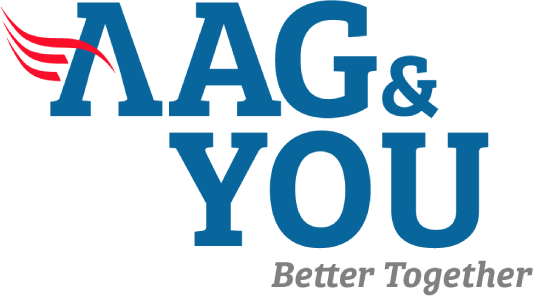 Why should I partner with AAG? We at American Advisors Group pride ourselves on our thoroughness and the personal relationships we build with our partners and borrowers. As the established leader in the industry, our proven and unique sales and marketing processes and comprehensive training program position us, and our partners, for sustained growth and success. The foundation of who we are and how we behave is based in three core values that our partners have come to expect when working with us: caring, driven and ethical. Caring for our partners and customers. Driven to provide superior customer service. Ethical in how we conduct our business every day. These core values define who we are and how we behave. With a reverse mortgage, there are no monthly mortgage payments as long as property taxes, insurance and maintenance are continued to be paid. Many seniors are resistant to the idea of selling the home they’ve lived in for years. That’s why a reverse mortgage is a convenient solution. Your client can stay in his or her home that they are comfortable living in while enjoying an additional revenue stream to cover health care costs or other expenses. Why Open a Reverse Mortgage Before it is Actually Needed? For industry professionals only – not intended for distribution to the general public. American Advisors Group, NMLS #9392, headquartered at 3800 W. Chapman Ave., 3rd & 7th Floors, Orange, CA 92868.